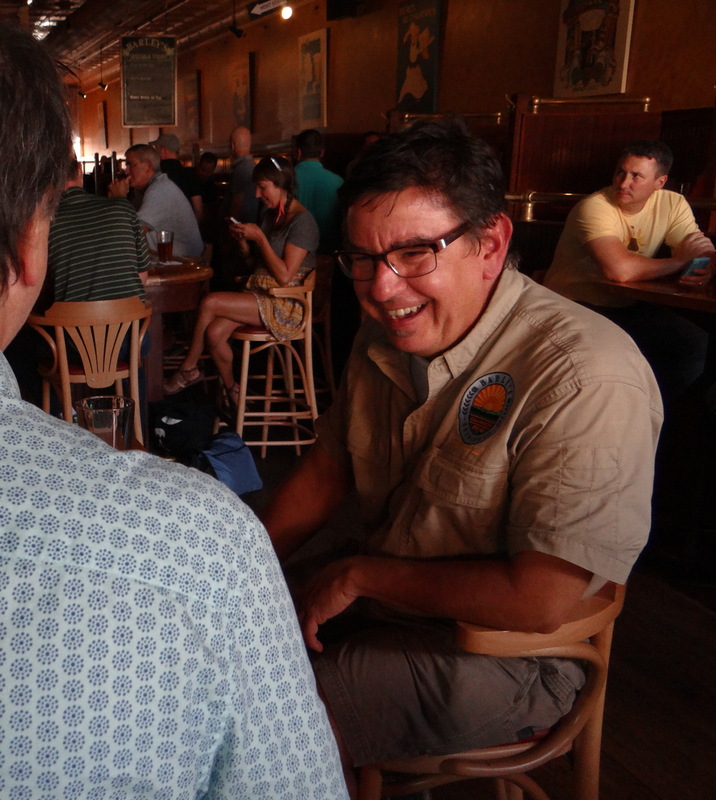 To wrap up my series on Barley’s Brewing and their long tenured brewmaster, Angelo Signorino, I solicited feedback from three people deeply immersed in the Central Ohio brewing scene. Without further adieu I turn the keyboard over to Colin Vent, head brewer at Seventh Son, Jay Wince, president and head brewer at Weasel Boy Brewing, and Jim Ellison, owner and operator of Columbus Brew Adventures. Angelo was kind enough to give me advice years and years ago when I was slowing becoming dissatisfied with the culinary life and looking to start my own brewery. He’d answer all my screwball homebrewing questions. He even let me come to Barley’s on my day off to brew a batch of their Scottish Ale with him. He then turned around and gave me a keg of that beer as a gift for me to serve at my wedding. He is amazingly upbeat, but never saccharine. He’s at every beer fest but somehow never grumbles about the stumbling masses all glassy eyed and speckled with puke. He’s been brewing in Columbus for decades but still legitimately wants your honest feedback about his newest beer. I’m glad to have him as a peer, and extremely lucky to consider him a friend. And that laugh, epic!! I first met Angelo and Scott Francis when I still homebrewing. We used to come in from Zanesville to pick up homebrewing supplies and Angelo was often working at the Winemaker’s Shop on those visits. He was always happy to talk beer and give out helpful tips about brewing. It was only later when I ran into him at Barley’s that I realized he was also a professional brewer. Like Angelo and Scott I tend to appreciate traditional styles and balanced beers, and I’ve always enjoyed the quality of the beer at Barley’s. My favorite memories of Angelo are from the times I had the opportunity to brew side by side with him as a winner of the Barley’s Homebrew Competition (Editors Note – Jay is a two time winner , 2003 & 2004, of the Barley’s homebrew competition). Those brewing days were a true partnership, It can be a bit intimidating to scale up from the small batch size of a homebrewer to the 20 or so barrel size they brew at Barley’s. Angelo did all that he could to help me make my beer the best it could be. I don’t think that’s true of everyone who puts on that kind of competition, treating it more like a PR exercise. This is just one of many examples of his respect for the craft of brewing. I’d include Angelo among the founding fathers of Columbus Craft Beer. Angelo was fortunate to cross paths with Scott Francis at a pivotal moment in time. First as a worker at the Winemakers Shop (where Angelo met and guided many of the current brewers in town today) and then as an assistant brewer at Barleys. Two (of a list of hundreds of) things to note on Barley’s and Angelo. 1) Angelo created the yeast used for many of the house beers in his home brewing kitchen decades ago, 2) He lost his wedding ring while brewing the first batch of beer there, which is why I think he is still there and the yeast is still doing well. His work at Barley’s alone would warrant any accolade a person would want to give him but that really just scratches the surface. In many ways Angelo is the spirit of Columbus Craft Brewing and the guy that has set the tone for the “class” of craftsmen and women in the Columbus craft community that have emerged in the second decade of this century. There are hundreds of stories of Angelo helping another brewer in need or offering encouragement. I heard Angelo say once “My default setting is to be helpful.” “So if someone asks me for a hand, I try to make myself available.” Angelo did so for Columbus Brew Adventures, his support and passion for educating our guests got the buy in and endorsement we needed from other breweries to launch two years ago. While we joke that an occupational hazard of being a brewer in Columbus today is having to attend the nearly weekly events and festivals, I can’t think of a time I did not see Angelo putting his whole heart and soul into representing Barleys and answering questions he has heard countless times like it was the first time and the best question he ever heard. Angelo is the superglue that holds this all together and a role model for how I would like this culture to continue to grow. If you missed the first two posts in this series, you can find them at the links below. What a great series! Sounds like Angelo is proof that if you love what you do, you will likely end up successful. That’s a great takehome message. Imagine what the world would b elike if everyone had that attitude.